Leesa and Purple have become extremely popular in the foam mattress industry in recent years. Traditionally, the industry has been dominated by the Tempurpedic mattress brand, which is a subsidiary of Sealy – one of the largest mattress manufacturers in the nation. You’ve probably seen their ads on television, they’re mattresses are extremely high-quality but also cost a ridiculous price. Increases in technology have allowed for other companies to enter the market and provide competitive products for a relative fraction of the price. Two of these manufacturers are Purple and Leesa, both of whom are even newer to the industry than many of the new entrants. The comparison we are doing today will help you decide which of these two mattress producers is providing the best value for money. The truth is that there is no clear superior mattress, it will depend entirely on you and your preferences. Make sure that you keep your partner in mind when you are looking at all the information provided in this review. Our comparison will begin with an in-depth look at the new manufacturer Leesa. Leesa has only began producing mattresses in the last couple of years, but they have grown increasingly popular with their client base. They have a simple design that doesn’t disappoint. If you’re looking for a mattress that provides comfort without sacrificing support, this might be one of the best options for you. It is also extremely affordable – Leesa is one of the cheapest foam mattresses currently available in the United States. All their mattresses are made right here in the United States. Leesa has also done a great job of bringing themselves up to speed with industry standards in terms of guarantees. You never have to pay for shipping inside the United States, and you can return your mattress within the first 100 days and receive a full refund – there really isn’t a risk in trying them out. All mattresses also come with a 10-year warranty, which covers a range of different issues that you may be concerned about with your mattress. The Leesa mattress is a pretty basic design. It isn’t too complex, which some people may consider a turn-off, but it really does provide plenty of comfort and support without overdoing it. This also allows them to keep down the price of the mattress. The Leesa mattress is constructed using three different layers that each come together to create the perfect mattress. Each of these layers and their specific purposes will be discussed in further detail below this section. This layer is constructed from Avena foam, which is a foam used exclusively by Leesa. It has been designed to be as breathable and comfortable as possible. You’ll find that this foam has similar properties to latex, except it is much better at preventing heat retention. This layer of the mattress is 2” – which provides you with all the comfort you need. This layer is also about providing comfort, it also creates a nice transition between the Avena foam and the support layer of the mattress. 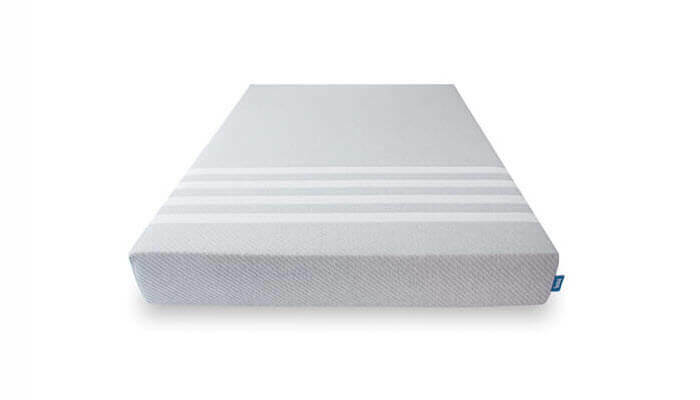 This layer is 2” of memory foam – which is the same type of foam that Tempurpedic uses to make their mattresses. This is an extremely popular material that provides more comfort than almost any other foam on the market. This is the support layer of the mattress – it provides all the foundation that is needed to create an enjoyable sleeping experience. Without this, you’d find that you sink straight through the bed. This part of the mattress is 6” thick, it also happens to be the most density that is found in any mattress layer. One of the best parts about this mattress construction is the amount of comfort it is able to provide without creating too much heat retention. Many foam mattresses that have top layers that are made from memory foam – which can typically retain too much heat. The Avena layer has ensures that this is not a problem. It creates a breathable and enjoyable top surface that prevents too much heat hitting and staying in the middle layer of the mattress. More information about the comfort and design of the mattress will be explored in further sections. Leesa doesn’t steer in too much of a different direction with their cover – they like to stick to basics. That’s why they’ve made their cover using the same piece of material for the entire thing. It’s a polyester-lycra blend and it creates a durable and enjoyable material which is sure to please anyone that wants a cover that provides support and is easy to remove. You may see a lot of modern mattresses with large and overdone cover choices, but with the Leesa mattress you don’t get any of this. This is actually better as it doesn’t interfere with the feeling of the mattress. If you’re purchasing a foam mattress that uses a high-end material like Avena foam, you don’t want your mattress cover to get in the way and potentially ruin the way it feels for you. Make sure that you always try and opt for a company that uses thin covers on foam mattresses as they generally tend to be much more comfortable in the long run. They also tend to be more durable. The Leesa mattress might have a fairly basic design, but it also comes with great deal of support. You’d be surprised at how well the mattress can support someone who has a normal weight distribution. We tested the mattress ourselves, and determined that the Leesa mattress comes in at a solid 6/10 – meaning it is fairly close to the middle of the pack in terms of support. This doesn’t bode well for those who weigh more than average, as you may find that you sink too far into the bed to enjoy sleeping on it. But it’s a great support level for those who weigh a normal weight, or for those who are light. Sometimes people who don’t weigh enough feel uncomfortable on over supportive mattresses, as they end up feeling like they are floating on top of it. Purple is the second mattress that we will be reviewing in this comparison. 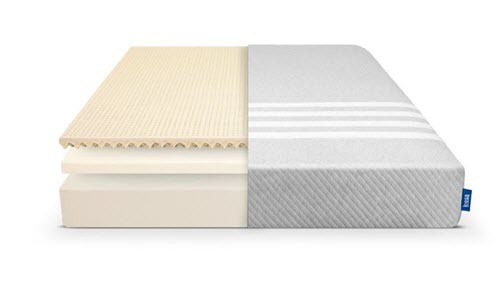 They use their own unique foam and polymers to create a truly unique mattress that has become a fan favorite amongst their clients. Purple has a great reputation for producing foam mattresses that don’t have the sinking problems that many of their competitor’s face. They also come in at a relatively competitive price point when compared to other mattresses. Like Leesa, all Purple mattresses are made right here in the United States, so you can be sure that your purchase is helping local workers and staff. If you purchase a Purple mattress it will be delivered to you completely free of charge as long as you live inside the United States. In addition, the warranty of the mattress is a standard 10-year warranty that protects against almost all major issues. You also have a 100-day money back guarantee with every mattress you purchase. The Purple mattress focuses more on the types of materials than the number of layers. Many foam mattress providers have been trying to use four or more layers to create increasingly complex high-end products. But Purple uses three layers, and focuses primarily on using high-end materials to create the most comfortable products they possibly can. We will explore the different layers and their uses in more detail below. This is constructed from hyper-elastic polymer. If this sounds advanced, that’s because it is. It has some of the best characteristics that you’ll find in the top layer of a mattress. It’s responsive, comfortable, and breathable – all things that come together to make an awesome bed for a good night’s sleep. This layer of the mattress is 2” thick. This layer is 3.5” thick and is constructed using polyurethane foam. Again, this is a great layer to provide comfort for the sleeper, but it also helps ensure that there is a bit of a buffer between the top and bottom layers. This is also made from polyurethane foam, it is 4” thick – this foam is slightly denser than the middle layer. It provides all the support and firmness that is needed to ensure the rest of the mattress can prioritize being as comfortable as possible. The cover is a made from a mix of different materials: viscose, polyester-lycra, and polyester. This means the mattress cover is extremely durable and is able to handle stress without losing its viability. It’s also extremely breathable, which is great considering the rest of the mattress has been designed to prevent retaining too much heat. Often, mattress manufacturers create a breathable mattress but then destroy it by creating a cover that retains too much heat. The Purple mattress is extremely comfortable. One of the primary reasons it’s so popular is because of the unique feel it has, which has managed to create a rather large fan base. As you will be able to see online, people rave about the Purple mattress and its responsive nature. It is able to provide enough support without pressing on pressure points or creating unwanted pressure. It also doesn’t have as much of a sinking feeling as many other foam mattresses on the market – this is due to its unique top layer. 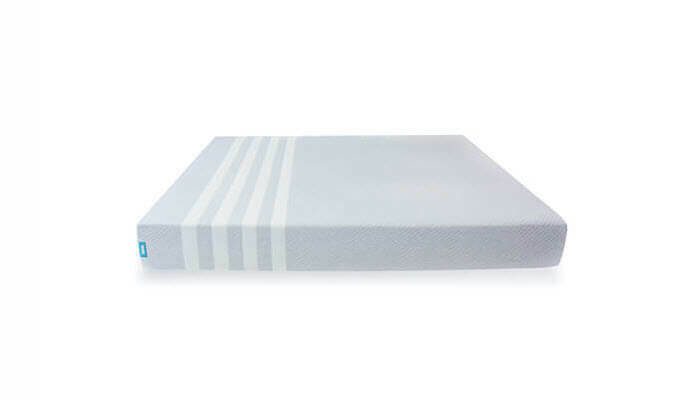 In terms of support, we’ve rated it at a 5/10 – meaning it falls right in the middle of the pack in terms of mattresses that are on the market. This is definitely one of the best options available to you if you think you want a mattress that has enough support to prop up someone of a normal weight distribution, but not too much to where it would be uncomfortable. Those who are of a heavier build will need to find a mattress that has a stronger support core, as you will most likely not be able to enjoy a normal sleep with this mattress. Although this review has provided you with all the information you need to make the right decisions when it comes to purchasing a foam mattress, it is sometimes better to look at all the information directly side-by-side. That’s why we’ve created a table for you to be able to have a more concise understanding of the benefits and drawbacks of each mattress. Both mattresses offer a unique feel that has been wildly popular with their customer bases. That’s why it’s important to ask yourself what you’re really looking for before you decide on a particular mattress – you will be sleeping on it every night for the foreseeable future. At the end of the day, the Leesa has a bit more support than the Purple mattress. Which is a trait that many people are looking for when they’re trying to find a mattress. 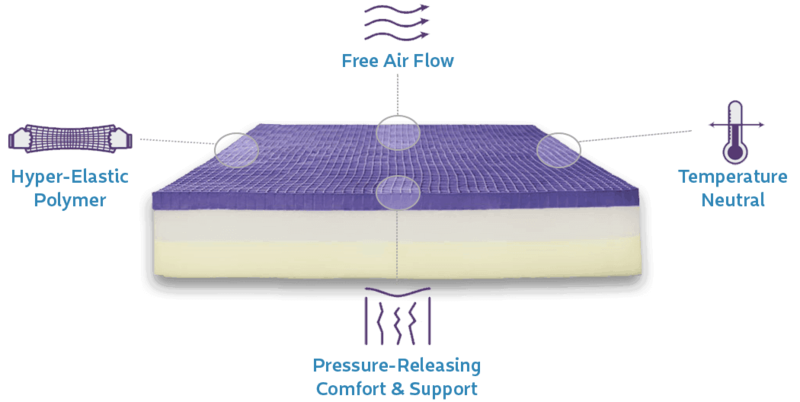 The Purple is very responsive, and it is therefore way different than a lot of the other foam mattresses on the market. That’s why you may prefer it over the Leesa. The Leesa is considerably less expensive though, which is a major selling point for a lot of people.